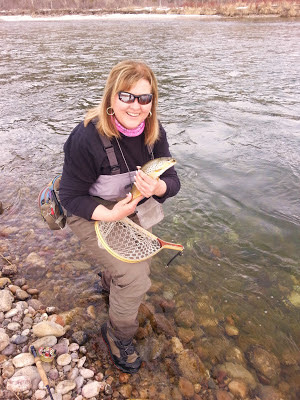 A two day fly fishing trip in RD's world usually is crammed with as much as you can get in. Not a relaxing five day trip, that's for sure. 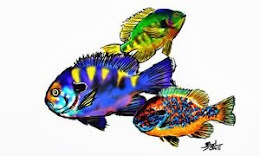 But, we still get plenty of fishing in and see a few side attractions as well. This trip will go down as the Wally World "Fly By" Adventure... 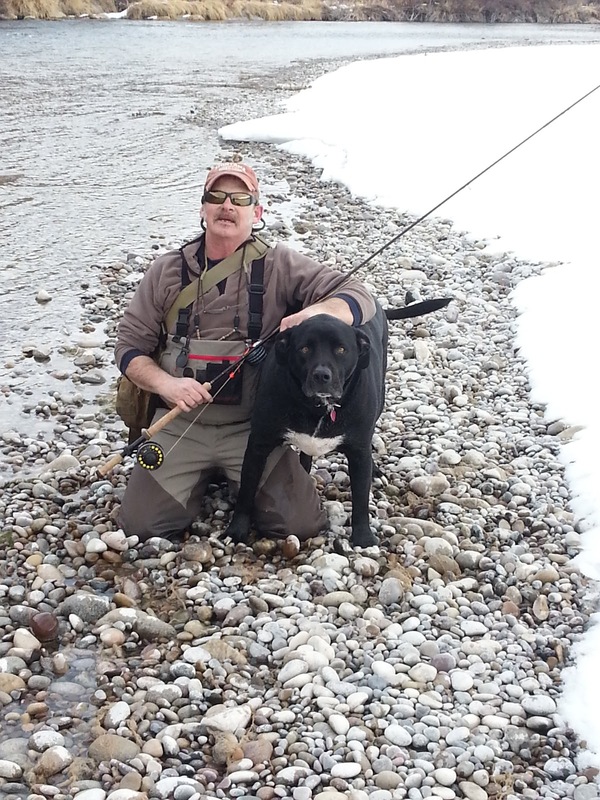 I met up with Ross Slayton, who is one of the 5 flyfishers in the IF4 movie, "A Deliberate Life". He has been a FB friend for awhile now and I have bought some really nice flies from him in the past. 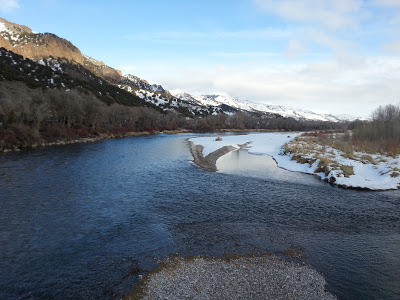 He lives close to the South Fork of the Snake and I have wanted to have someone acquaint me to that river... So, I thank Ross for sharing some river time with me! Ok...moving on. The South Fork of the Snake. Outside of Idaho Falls, ID. and I walked the river bank to find us some trout! 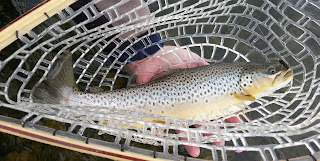 Then, it was time to land a nice, big brown trout!! 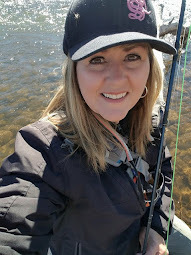 As I worried that he would break off as my rod did a nose dive, Ross just sat on a rock behind me exclaiming, "you got him, you got him..."
The Walmart "Fly Fishing Shop"
Ross was nice enough to take RD there for a post worthy report! Yes, it's true. There are only a few of them. The "Big Box" store gets it's tentacles into fly fishing. 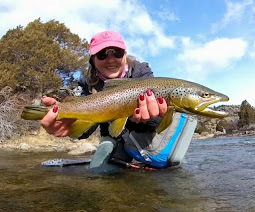 I will always be an advocate for the small and personal fly shops, but I thought that it would be interesting for you to see what's in the "Box". blue vests with a smile??? Maybe not, but I'm sure their thingamabobber indicators have those smiley faces on them! Blue Damsels ~ Not well made, but still Damsels! 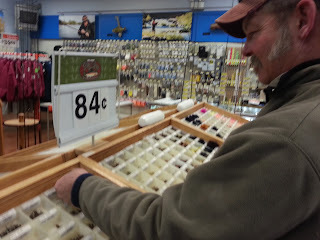 Yup, cheap enough flies. Just remember you get what you pay for, usually. A few fish might go after them. You never know. No, Ross. Those don't look like your ties! 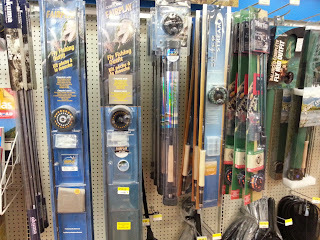 Rods and Reels. Not names like Sage, Winston or Redington. But, they do carry South Bend, Shakespeare and Eagle Claw to name a few. Brands that appeal to those starting the sport or that are on a budget. They did carry the Ross starter combo sets. And a few bigger items, like pontoons! ﻿Now we take you to the "tippet wall". Hey, it's RD with some Cortland Fair Play tippet... A decent enough tippet to make your outing successful. I have tried three different brands of tippet and still go back to Rio. But, in a pinch...this could very well work. I have heard some decent reviews. I don't put live ones on the end of my line! The "Big Box" is a bit confused here. We must go back to the display case for a minute... Check out the plastic figures. 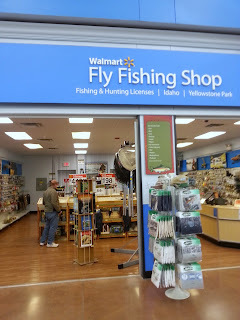 Sunday Tippet: Yes, I can now say that I have seen a Walmart Fly Fishing Shop. Will I be back? Probably not. But, I have 5 or 6 fly shops nearby that meet my needs and offer the most excellent customer service that you could ask for. And that goes a long way in my book! They know who RD is and the special needs like boot spikes, wading sticks, and magnifiers that I am in need of! 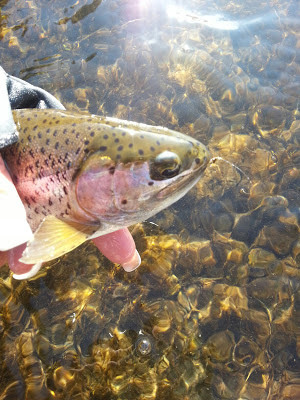 And I can always get an up to date fishing report along with what bugs are working. Bonus! 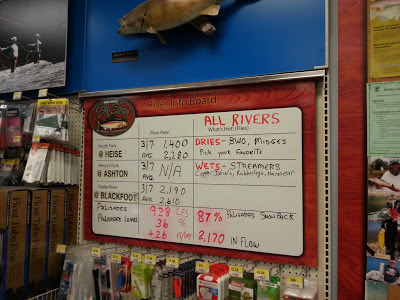 But, if you are a bait fisherman, you can get your supplies along with worms (oh, you might have to check in the fly fishing section for that one), powerbait, and licenses in the separate Fishing Department. Oh, I almost forgot... There was one more day. It was a gorgeous, sunny day at the Warm River and the South Fork of the Teton River. 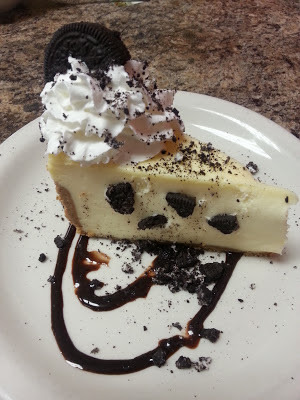 It was a perfect way to send me home with a smile. 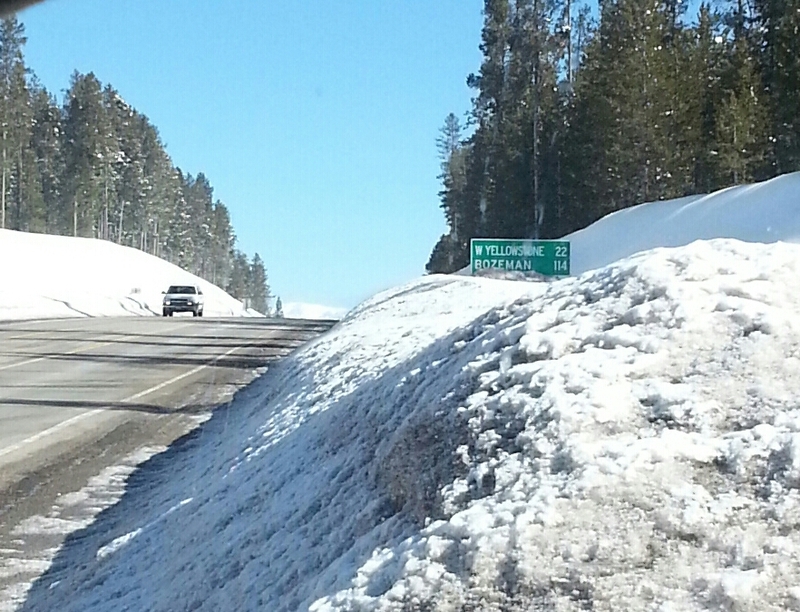 = ) Yes, Yellowstone Country still has the white stuff stacked up! Gorgeous, huh? That's why I continue to find an "adventure in every riffle". 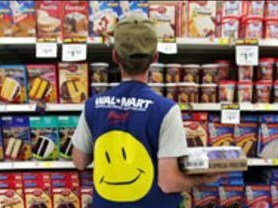 And Walmart, you will still continue to be the place that I buy my Black Forest candy. 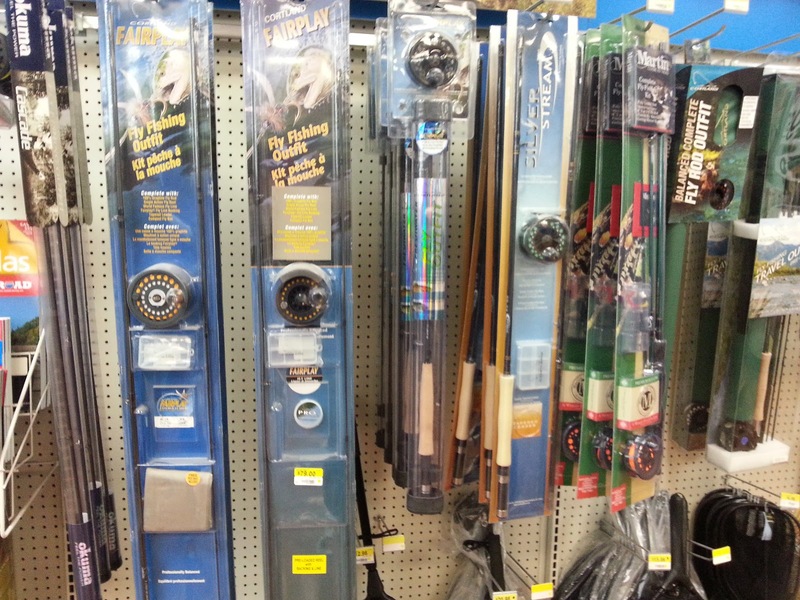 In our local Wally World, they have a small part of the fishing section with a few fly fishing things. I shudder each time I have to walk by it. Gives me the Wally's, I mean Willie's. 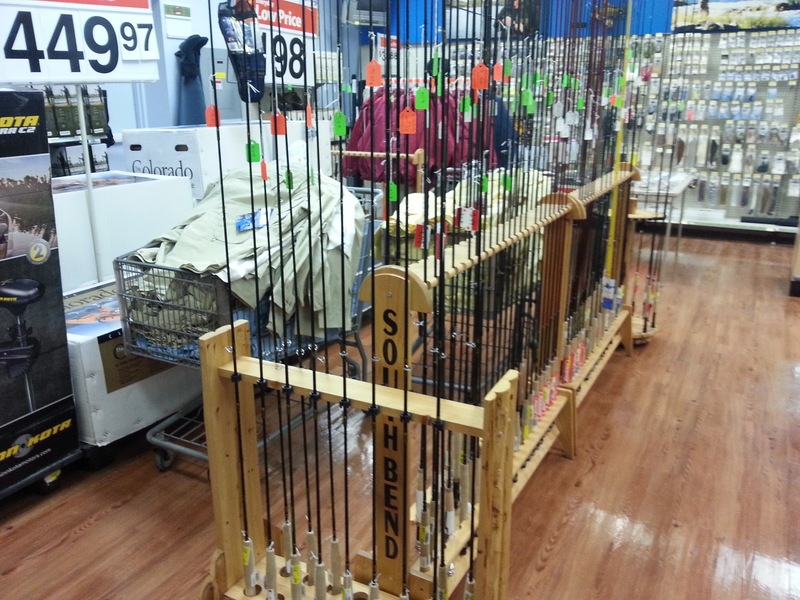 I thought our Walmart was the only big box to carry fly fishing supplies. 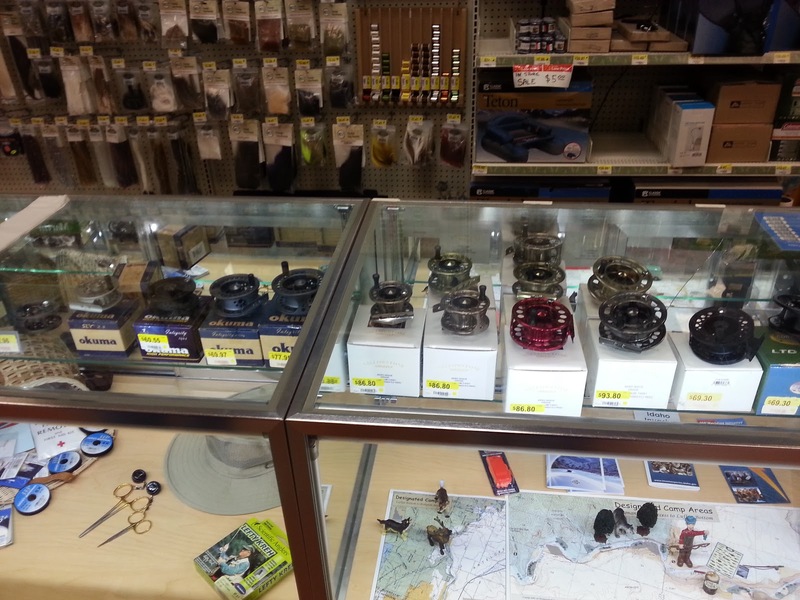 We have a small area in the store for a few essential items dealing with fly fishing, really surprising. Beautiful country you were fishing there and a nice brown to top the trip. Enjoyed the post!! Thanks, Bill. I think that would be enough. Just put out a fly fishing combo set, some leader and tippet. Honestly, if they are only going to offer shoddy looking flies (yes, there is the real truth), they might as well not sell any. Unless, you were going to feed them to bass who eat just about anything! Lol. 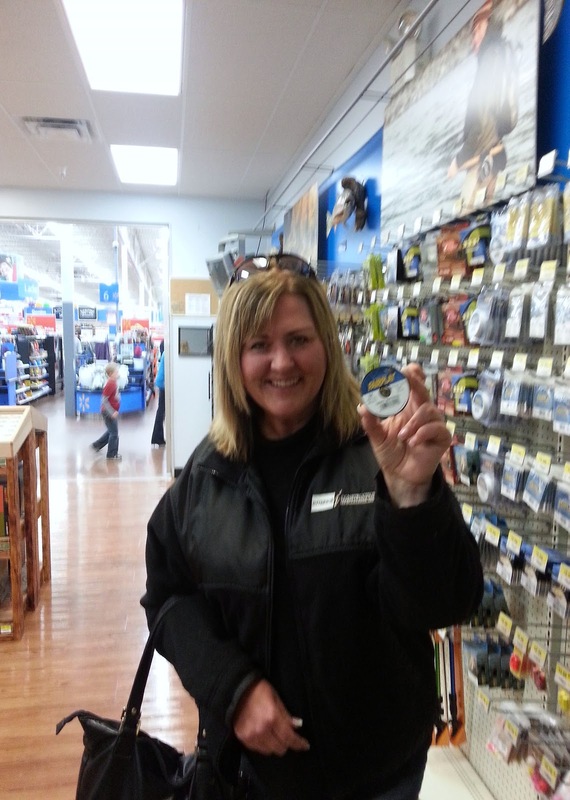 Thank you for sharing the Wally World fly shop. I would have never imagined that such a thing existed... but somehow I'm not surprised either. That's just one more reason to dislike what Walmart has become. Trying to dabble in an area where they have no expertise. 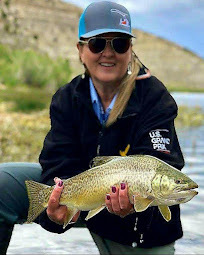 I was wondering what rod & reel brands they would carry, and I'm glad to see that the quality fly shop brands aren't heavily involved. I still love Eagle Claw, South Bend, and Okuma for what they are... but they're already in all of the "big box" sporting goods stores so this doesn't surprise me or change my view of them. I'm a bit surprised by Ross though. I can certainly say this, Bill and I aren't likely to have this kind of shop in Alabama anytime soon. This has got to be a regional niche market thing, but I'm still a little surprised that it is sustainable at that level... even in trout country. Jay ~ The Evil Empire has struck again! Yes, they do like to dabble in everything...don't they? Ross is offered on the Walmart website. 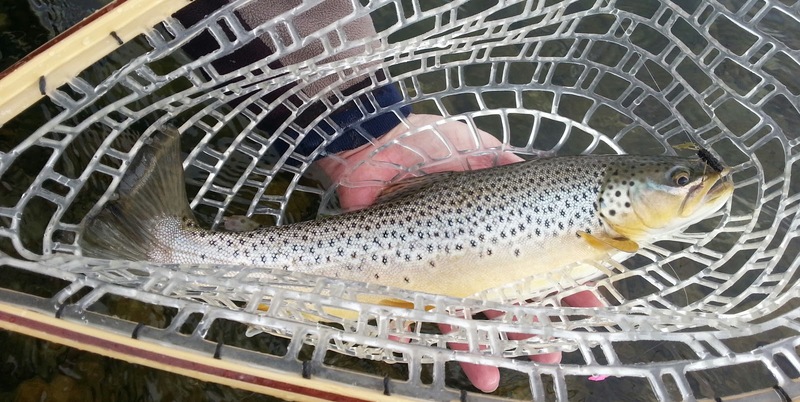 And yes, in the middle of the best trout country in the states...dabbling is very dangerous!! I would say that they would lose big in that area. But, surprisingly enough, that fly fishing shop has been around since 2005. So, what does that tell you? Can't blame em for trying, and with any luck they'll plant the seed in some folks. 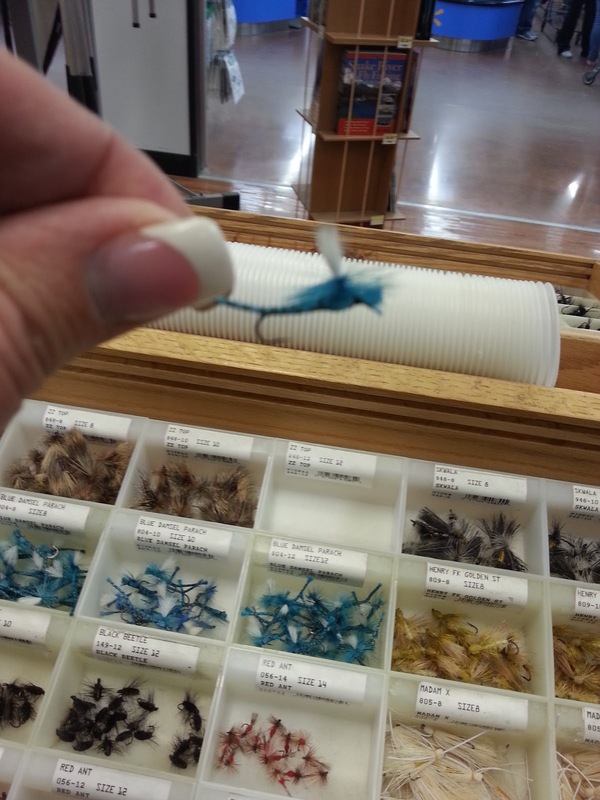 I'll stick with the Juicy Oozer type flies Wally World offers. Thanks for that report. The river looks quite nice. Just seeing those river pics lifted my spirits a little. 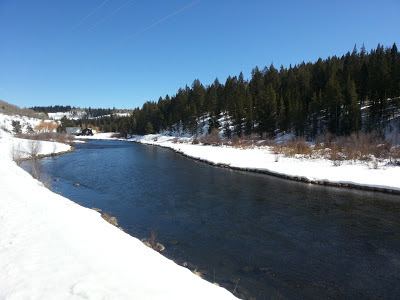 Marc ~ You never know if someone will walk by and see the map with elk, wolves and bears and want to learn how to fly fish! You are exactly right!!!! 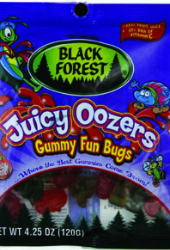 J/K... And the juicy oozers are definitely the best bugs that they sell at Wally World. Hands down! 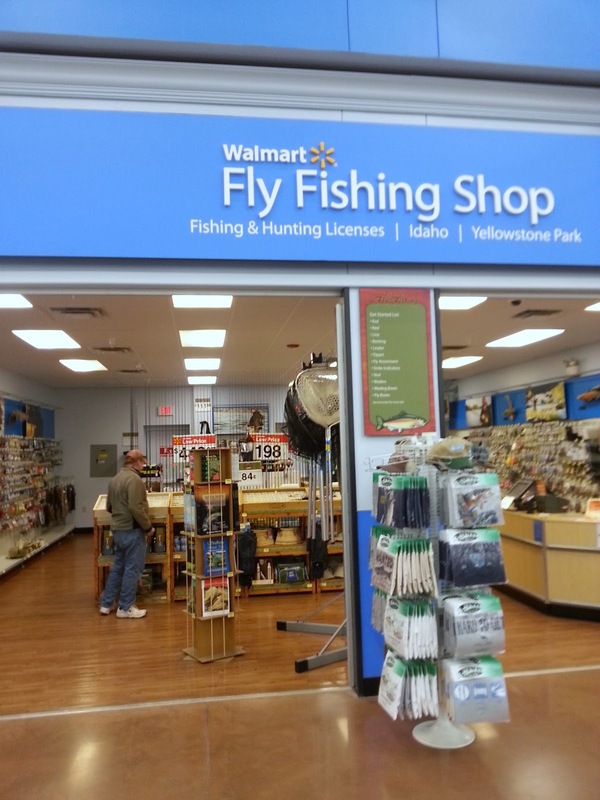 Mike ~ I think that enough people support the local Walmart to let the rest of us spend some time at the fly shop down the street. 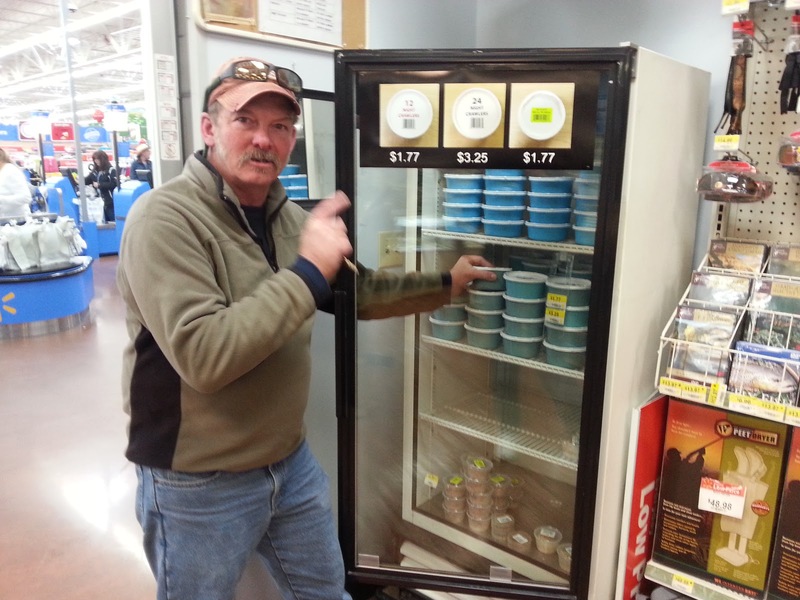 = ) But, it could save someone's fishing day to be able to buy some tippet at 6 am... Good point. I had no idea there was even such a thing. Daniel - It seems to be more of a Western spackeling of in-store shops. Thanks for stopping by! Definitely, it's about location. 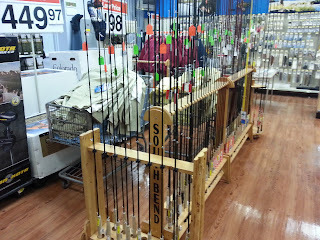 My Wally World doesn't cater to fishermen. 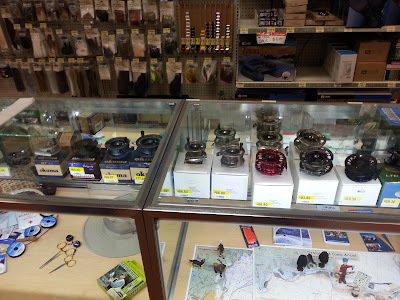 Instead we have a hookah department where you can find the latest in "smoking" accessories. We have a large do-it-yourself pharmacy and three fast food munchie shops. I need to move. Howard ~ Why move? It's sounds like you have a convenience store right in your back yard... Hookah hookah! 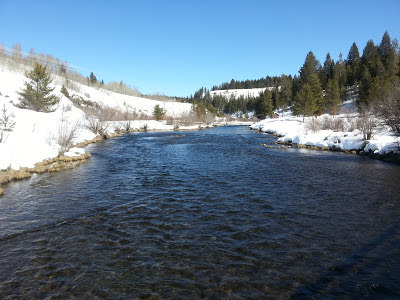 Keep tying your flies to take to the river. You will catch a lot more on them instead of these Wally flies made in China. I want to fish with ROSS TOO!